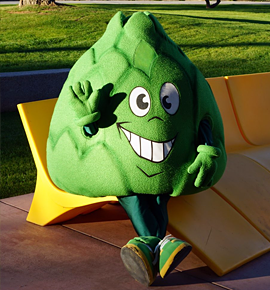 SCC students hear it all the time: “Aren’t you guys like the Brussel Sprouts or something?” The proud SCC student will correct them, “No, we are the Artichokes.” However, many aren’t aware of how we got our mascot in the first place. SCC was founded in 1970. Like many other colleges, the school wanted to use athletics to increase the popularity and marketability of the college. This included recruiting athletes from out of state with the new college’s limited scholarship fund. By 1972, there was a 1.7 million dollar gym towering over the rusted portable homes that were used as classroom space. The plan was to make the “SCC Dovers” a Junior College athletic power, to the dismay of the academic minds on campus. A few years later, the administration asked the student body what it wanted to change the mascot to. The student government facetiously gave the student body three options: the Artichoke, the Rutabaga, or the Scoundrels. After the Artichoke won, an infuriated administration called for a re-election due the low turnout (11% of the student population). The war raged on: the athletics department versus the academically-driven student body. The following week, there was a re-election. Well, we all know the result. The Artichoke won by a wide margin. After several years of division and turmoil over the mascot, the Artichoke has become a delightful quirk on the SCC campus.